Transform Exteriors are a business partner with Southampton City Council Trading Standards service Buy with Confidence scheme. 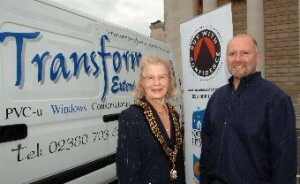 Set up by Hampshire County Council to establish high standards of trading by local businesses. Specialising in UPVC, we install made to measure Windows, Conservatories, Porches, Doors, Fascias and Guttering. Transform Exteriors is a family run business with personal involvement from, taking your inquiry, to cleaning down that new window. We can design and construct a conservatory tailored to your requirements. Our business has grown almost exclusively on recommendations from past customers. With over 30 years experience in the building industry our knowledge goes beyond that of being just plastic fitters. Started in Bournemouth and now based in Southampton Transform Exteriors has many satisfied customers along the south coast. Transform Exteriors is A FENSA registered company. We offer a 10 year guarantee and a Glass & Glazing Federation insurance backed guarantee should you need that extra peace of mind. FENSA stands for the Fenestration Self-Assessment Scheme. Following Government encouragement, FENSA has been set up by the Glass and Glazing Federation (GGF) and other industry bodies in response to Building Regulations for double glazing companies in England and Wales. When replacing windows, doors and roof lights in dwellings in England and Wales, homeowners must comply with current thermal performance and Building Regulation standards and ensure they get a certificate from a Competent Person scheme such as FENSA or Local Authority Building Control. FENSA enables companies that install replacement windows and doors to self-certify compliance under these Building Regulations without the need for a separate assessment from Building Control. Transform Exteriors has been a member of FENSA since 2002.